Thursday morning, the children came to our bedroom as usual. It was seven o'clock on the 25th April 1991. Just another ordinary day. Innocently I told Ashley (age 5) that today he was not going to school today; nor tomorrow; nor next week. Ashley loves school and was most alarmed. How instead, I asked him, would he like to go to the airport that very morning and get on an aeroplane for Singapore? He thought it was a good idea. The flight to Singapore lasted over twelve hours. We arrived there during the early afternoon and, although tired, resisted the temptation to go straight to bed. After finding a hotel, we ventured to Orchard Road, a well-known shopping area. It was very hot and humid. Jason, our two year old, remained good-natured throughout despite having had less than two hours sleep in the past twenty-six hours! The next day was spent sight-seeing. We explored the Chinatown area, experiencing some of the amazing sights and sounds (and smells!) of this incredible city. Later, we crossed by ferry to the resort island of Sentosa. Here, a beautiful island with beaches, golf courses and forest gave us some relief from the hussle and bussle of the city. The boys in particular enjoyed Sentosa. Initially we toured the island by monorail, then explored its gardens and jungle nature trails. We saw wild monkeys, colourful birds and much, much, more. Finally we returned to Singapore, this time by cable car. The views of Singapore and its great harbour were magnificent. Sunday was our last day in Singapore and we had arranged to meet Kathy Burgum (member HH 077) for breakfast. Kathy was born in Bolton, Lancashire, in 1944 and works as a chartered accountant and has lived in Singapore for some time. Kathy and "K.P." (her other half), took us for an ethnic breakfast in one of the Singapore suburbs, which was an experience! (Kathy hopes to write an article about herself in a future edition of our journal). Time was short and soon we found ourselves boarding a Qantas 767 for Cairns, in Northern Queensland, Australia. At Cairns, we were met by Alex, a relative of Vicky's and it was after midnight before the boys were tucked up in their beds. The night air was warm and full of strange noises, but the boys' excitement soon gave way to sleep. Alex's house and its location can only be described as beautiful. It sits upon a hill called Yorkey's Knob and overlooks the Great Barrier Reef. Coconuts, bananas, coffee and orchids grow in his large garen, which falls steeply away to the sea. Some days, we were content to relax about the house, with an afternoon walk to the beach for a swim. Another day, we visited Green Island, on the Great Barrier Reef. The Reef is one of the natural wonders of the world and even Ashley tried his hand at snorkelling. Swimming over the coral, among the tropical fish, is an amazing experience. The next day we did one of the great railway journeys of the world. 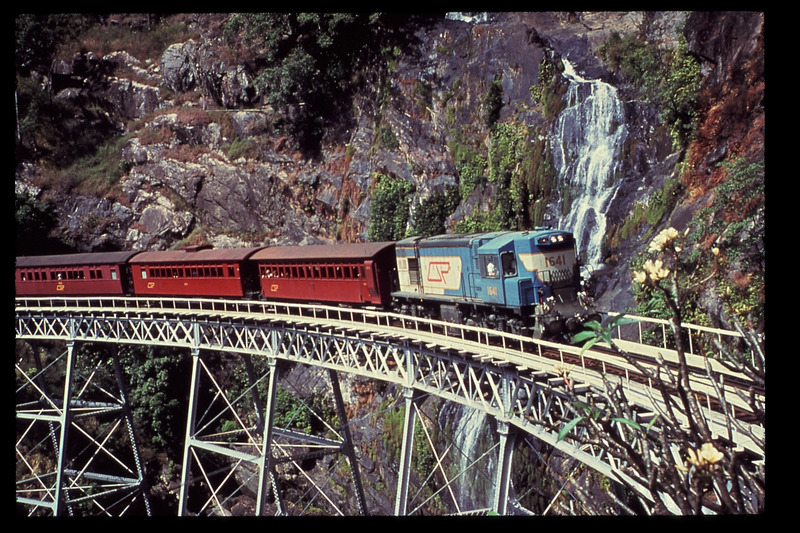 The Cairns-Kuranda railway passes along a deep gorge and through 15 tunnels, 93 curves and dozens of bridges. It was most spectacular rising from the coastal plain to the high tablelands. Kuranda, itself, is full of character but the highlight for me was the Tjapukai Aboriginal Dance Theatre. During the second week we gave Alex a rest, touring the coast and tablelands on our own. We went as far north as the roads permit, to Daintree. We explored tropical rainforest, swam in the Mossman Gorge and saw crocodiles in the Daintree River. After a few days more with Alex, we finally said our goodbyes and, on 12th May, flew south to Brisbane. There we hired another car and drove north to explore. We visited the Sunshine Coast and the Glasshouse Mountains, but our main reason for coming to this area was to meet another of our members - Mary Burgum (RR 074). Mary has been a treasure, sending me old letters and photographs associated with her section of the Burgum family and I was keen to visit her. 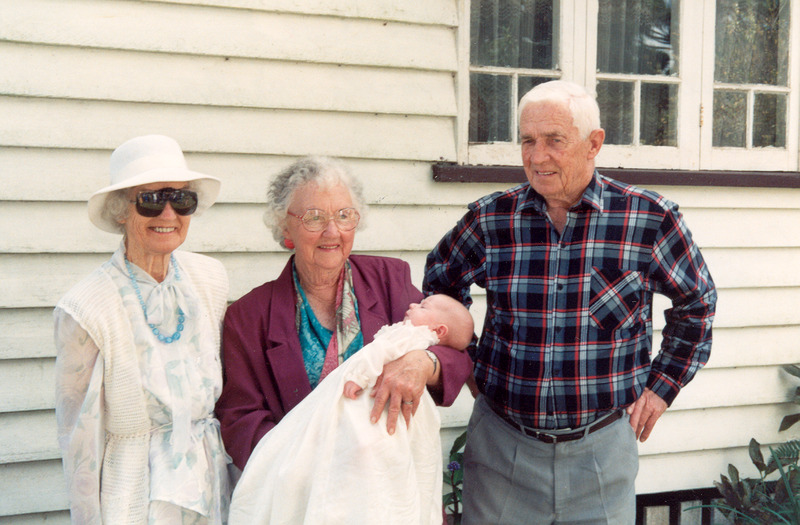 We arrived in Maleny on 14th May and met Mary at the home of Frank and Edna Burgum (Frank is Mary's brother). William Burgum was born in the Forest of Dean (Littledean) in 1874, emigrated to Australia and, in 1907, married Cosette Weitemeyer at Brisbane. Mary, their only daughter, was born in 1910. There were also four sons - William, Raymond, Tom and Frank; all were brought up on the farm. Tragedy struck in 1921 when William senior and his son william were drowned recovering cattle from a river running through the property. It is difficult to imagine the consequences of such a loss. Mary, the eldest, was only ten and Frank, the youngest, was just six. (Perhaps one of the family would write and tell us more about that amazing struggle). Frank and Edna guided us through Maleny towards Burgum Farm. First, we stopped to view and photograph the roadsign leading to the old homestaed - "Burgum Road". On the farm, we were able to see the old family house, since modernised by its new owners. "Once this whole area was covered by trees and bush," Frank told us. He recalled the backbreaking work, clearing the land. Today, the green rolling hills support dairy cattle. On one of the hills surrounding the farm stands the house where Frank and Edna had once lived. Later they had moved into Maleny itself. On another hill, hidden amongst the trees, stands Mary's house. Their brother Tom had also had his own place on the farm. I had heard much of Tom Burgum and I felt, very much, the reverent pilgrim. Two houses stand on the site, one right in front of the other. Tom's original "cabin" now has a side missing from it. Frank told us about an old carpet snake that used to live in the roofspace. "Better than a cat," he grinned. "Ate all the rats!" Tom's place is still used by some of the family from time to time and, although basic, remains in good order. Tom prefrred to live alone and had simple needs. (Tom had an interesting life and perhaps someone in the family would consider writing an article about him. I do know Tom saw active service during the Second World War and gained a reputation as a marksman. Amongst other things, he worked as a farmer, a prospector and a bushman). Towards the end of our stay in Australia, the area received some much needed rain. This was great for Southern Queensland, but not so great for us. On our way south to Brisbane, we drove back through the area of the Glasshouse Mountains. We sat at a view point for some time, hoping the weather would clear. It didn't. We drove away, down the hill. The road was wide and not especially steep, but when I touched the brakes to slow down, the car began to swing. The road surface was like ice and as I tried to recover, the car swung the other way. The car went sideways, then backwards, then sideways again before leaving the road. We passed through bushes, sideways on, before coming to a halt near some rocks. Beyond the rocks, the ground fell away. We were lucky not to roll. We were lucky to be alive! With ropes and a four-wheel drive vehicle, the car was pulled from the mud. Amazingly, the car was not damaged and we continued our journey (more gingerly!) to Brisbane. The rain continued to fall and the visibility, at times, was marginal. Finally we arrived in Brisbane. We checked into a hotel and turned our attention to the next part of our journey. It was Friday 17th May and we stared out of the windows as the aircraft made its approach into Auckland, New Zealand. Our firsttask was to hire a car. Considering there were four of us, and we were going around thw world, we felt we were travelling light. We had two large suitcases and one cabin bag each. We confirmed with the car hire company that the bags would all fit in the boot (trunk) of the car. "Oh yes," they said, "no problem." We were persuaded to travel into the city to obtain a larger car. The boot size was only marginally bigger and still the bags did not fit. Finally we were offered a station wagon, but only at an additional cost of £150. This, our third car, proved to be totally unsatisfactory (and expensive, too!). It was very late, we were very tired and no other car was available. We took the station wagon and searched for a hotel (in the pouring rain). It was Vicky who finally had a brain-wave. We had already decided to take the car back the next day. Why not cut our losses and fly to the South Island? Make a clean break of it. We could do the North Island later - maybe the weather would have improved by then! Then another brain-wave from Vicky. (See why I married her?). Why not leave one suitcase here, in Auckland? The idea certainly had merit and the next day we deposited a re-packed suitcase with the hotel porter and returned our hire car with just a few miles on the clock. Soon we were on board yet another aeroplane flying this time to Dunedin in southern New Zealand. Dunedin is a beautiful city (very much like Edinburgh) and the autumn air was clear, bright and blue. It was there that we saw the seals and the yellow-eyed penguins (the rarest penguins in the world) on a secluded stretch of coastline. The next day we drove across the South Island to Te Anau. This area of south-west New Zealand is very much like Norway, with fjiords and high mountains. The next morning we were up before dawn. It was Monday 20th May, a day that will live in our hearts and minds for a long time. In the half light of dawn we drove along the shoreline of Lake Te Anau towards Milford Sound. Thw inding road rose gently at first into the mountains and the views became more and more splendid. After several hours of driving, we reached a mountain wall. The high snow-covered peaks were all around us as we disappeared into the dark, unlined dampness of the Homer Tunnel. Beyond lay Milford Sound and we descended down the valley to the road's end. Milford Sound is spectacular, beautiful and isolated. A small hotel caters for the independent traveller as most tourists are bused in for the day from Te Anau and Queenstown. Several vessels sit by the quayside waiting to take the tourists out on the two hour journey along the fjiord to the Tasman Sea and back again. We took an early sailing, avoiding the hords, and nudged our way down the deep fjiord. The views were outstanding and really beyond anything I have ever seen before. At one stage we were joined by a school of dolphins who swam alongside, playing in the bow wave of our ship. On our return, we had lunch at the Milford Hotel. It was there that we negotiated our helicopter ride! Soon afterwards, we were hurtling to within a few feet of a giant waterfall, then skimming low over a glacier. For twenty-five minutes we experienced the ride of a lifetime. From ten feet above the mountain ridges from six thousand feet, the views were amazing. In Queenstown we experienced the thrills of jet-boating. These boats can operate in less than four inches of water. We sped down the deep canyon of the Shotover River, passing within inches of the steep, rocky sides at high speed. Simply thrilling! Queenstown was lovely, but soon it was time to drive back to Dunedin. From there, we flew to the North Island and Wellington. I have an uncle and aunt in Wellington (on my mother's side) and we spent two nights with them. My uncle is terminally ill and I wish him well. Once again, and all too soon, it was time to leave and we began our way northward to Auckland. Three active and spectacular volcanoes dominate the centre of the North Island; Mt Ruapehu, Mt Tongariro and Mt Ngauruhoe. We spent a night in a hotel on the side of one of these mountains. An interesting notice on the back of the door spelt out the fire drill and the volcano drill! The next day (Wednesday 29th May) we arrived at Lake Taupo, the largest lake in New Zealand. There, we went sailing in a yacht once owned by Errol Flynn. What a wonderful experience. Next, it was on to Rotorua. The earth's crust is particularly thin here and steam issues from the ground. Geyers spout high into the air, mud pools bubble and a pungent rotten egg smell fills the air. In the evening, we went to a Maori Haka and Feast. (A Haka is a Maori war dance). Our five year old son, Ashley, proved to be the star of the show when members of the audience were invited up onto the stage. He recieved a standing ovation for his efforts and we were very proud of him. Finally, back in Auckland, we boarded our long flight across the Pacific for Tahiti and Los Angeles. During the first few days we toured Santa Monica, Beverly Hills and Hollywood. Then we moved south and checked into the Disneyland Hotel (for the kids, you understand!) Disneyland is pretty demanding, but the kids kepts up a good pace. We enjoyed it, too! The around the world tour was planned late on and, just days before our departure, I hurriedly wrote letters to some of our BURGUM FAMILY HISTORY SOCIETY members in California. Once in LA we made contact. Soon we were driving down the freeway towards Encinitas and San Diego, in Southern California. We met at "Scotty's" house, although Scotty himself (FF057) was away in Minnesota. There we were greeted by Margaret (Peggy) Anderson (FF055) and Bob Scott (FF054). They are all grandchildren of A. T. Burgum. One note of sadness was the absence of Angus MacAdam. Angus died earlier this year. He was eighty-nine. Gradually we met other members of the family. Bob Scott and his wife Jeannine took us out for dinner that first night and Bob offered to show us something of San Diego the next day. During our conversations, I mentioned John Burgum, an artist who had painted landscapes on the doors of the famous Concord Stagecoaches. Bob told us there was a Concord Coach in San Diego and we decided that would be our first port-of-call. Old Town is an area in the city of San Diego, rstored and preserved as a living museum. 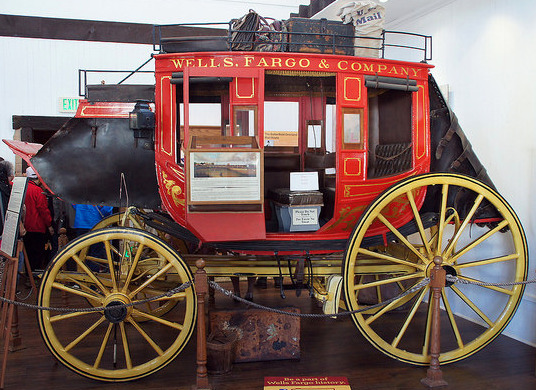 Amongst the old style shops and restaurants stands the Wells Fargo museum and it was there that we found a Concord Coach. On the coach doors were landscapes, originally painted by John Burgum. The Wells Fargo staff showed great interest in my claims and scurried away to check my story. As we continued to look around the museum, I was presented with a bag. "We owe John Burgum a great deal," they said. "We can't thank him, but we can thank you." Our bag of "goodies" included tee-shirts, scarves, badges and chocolate, all with the Wells Fargo logo. It has also been suggested that they may wish to include my photgraph in the Wells Fargo magazine. Fame, at last! We continued our visit of San Diego and enjoyed it very much. (I warn you guys, we will be back!). We said our goodbyes to the Scotts, then made our way back to Encinitas. There we were to rendezvous with Peggy and Bob Anderson, then make our way to Carlsbad. Bob and Peggy have two beautiful daughters, Bobbie and Sandie. Bobbie (FF083) is married to Bob Mowry and we had been invited to their house for an evening barbecue. Sandie joined us later. Ashley got on well with their young son, Brett, and we had a wonderful evening too. All too soon, the time was gone and it was time to go. I hope we meet again, soon. Finally we drove north to LA and caught our flight bound for London. We returned with seven and a half hours of videio tape and thousands of memories. We visited Singapore, Australia, New Zealand and the USA and, on the way, saw and experienced many wonderful things. In forty-four days we made our way around the world, making several new friends (or are they extended family?). Either way, we will not forget them.